GPD Win: Doom apparently plays on it? So The GPD Win...plays the DOOM! This little handheld...I want it. 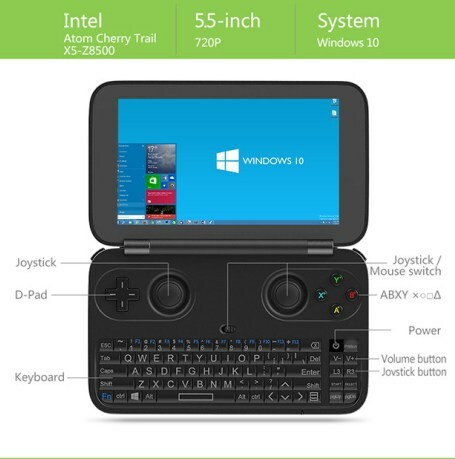 From the Wire: Pretty much right on schedule, GPD have begun shipping their Windows 10 handhelds out. In true crowd funding style, many backers are still waiting for theirs to ship whilst others have simply bought one from a store and received it already. I feel your pain (I pre-ordered a Pandora back in 2008). Videos began cropping up on YouTube just over a week ago, which I'm sure no one has seen, because this is pretty obscure. It started in December 2015 as a bit of back and forth between GPD staff and the community of the Dingoonity boards – talk of the possibility in them building a Windows 10 handheld. Some (very) rough ideas were posted by the GPD team and discussion begun. Given GPD’s good track record and obviously decent R&D budget I don’t know why crowd funding is required to get this thing off the ground. I suppose this is a machine with more of a niche market than an Android Handheld, and more expensive hardware is required to power it – so the risk for GPD is greater. The GPD Win, as it’s called, is powered by an Intel Atom X5-Z8500 and 4GB of RAM. It’ll house a 5.5″ 720 display, 64GB of eMMC storage, an SD slot and will of course have WiFi built in. I find this thing very intriguing. I don’t really know what I’d use it for though. It’s too small to be productive with, and Android emulation is so mature now that in some cases it will beat a Windows equivalent – at least on the low end hardware found in the GPD Win. Having said that, I don’t think I can live without one.